From October 27 to November 22, 2017, Group employees are taking action to map the accessibility of their hotels and local businesses on the “Jaccede” app. The challenge takes the form of an international competition pitting seven teams against one another in the main regions around the world where the Group operates, in order to strengthen a sense of collaboration and promote diversity. Both a website and a mobile app, Jaccede is a collaborative platform on which people can review the accessibility of the places they visit to enable people with reduced mobility to identify the places that meet their needs. More than 100 000 sites globally, including hotels, restaurants, bakeries, pharmacies, etc., are already listed on the app. Since the challenge was launched, more than 10 000 addresses have been added to the platform. The team that adds the highest number of sites will win the challenge, with the results to be revealed on November 27, 2017 by Sébastien Bazin, Group Chairman and CEO. The results will be announced during a LIVE Conference on accessibility and disabled sports taking place at the Group’s headquarters in Paris*. During this conference, Michael Jeremiasz, four-time Paralympic medalist in wheelchair tennis, and Thu Kamkasomphou, table tennis player and five-time Paralympic Games medalist, will talk on the theme "changing attitudes towards disability" and lead disabled sports workshops for employees. Anne-Sophie Béraud, AccorHotels Vice President Diversity & Inclusion, said: “As an active member of the ILO Global Business and Disability Network, AccorHotels is working alongside other companies in the network to promote the professional integration of people with disabilities around the world. Today, the Group is going further and is involving its employees in new initiatives to improve both the access and experience of guests with reduced mobility in its hotels. Welcoming and accepting others, growing from and valuing our differences, are some of the founding principles of AccorHotels”. Having consulted disabled employees in the search for smart technical, technological and design solutions, the teams are reinterpreting accessibility standards far beyond to offer an accommodation experience that puts an end to the segmentation between PRM (Persons with Reduced Mobility) and other rooms. 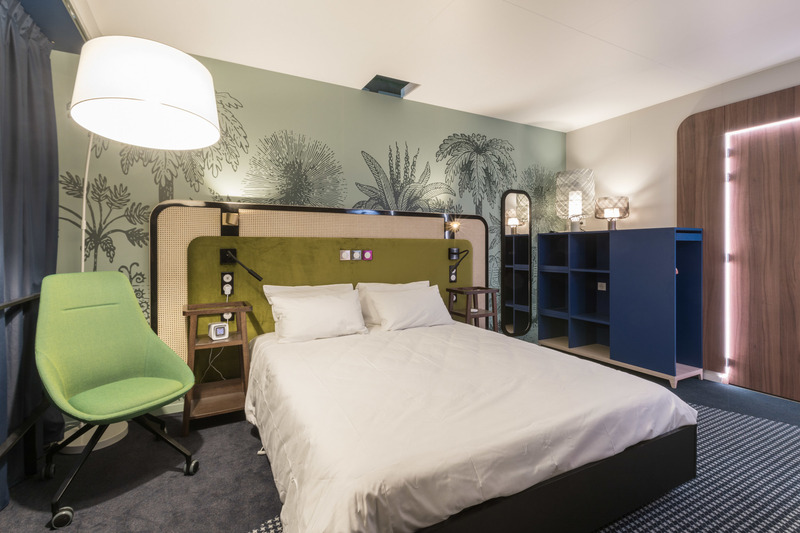 “With this concept, our goal is to inspire the hotel market by introducing a new approach to the PRM room, which is often unoccupied, not very welcoming, and stigmatizing... We have envisioned a room for everyone, with design and creativity adhering to PRM standards and practices to the point that they disappear to the benefit of emotion and sensorial experience. This innovation can be tailored to all our brands in all segments. It reflects the Group's desire to pave the way towards positive hospitality and to respond to the concerns and requirements of all our guests”. 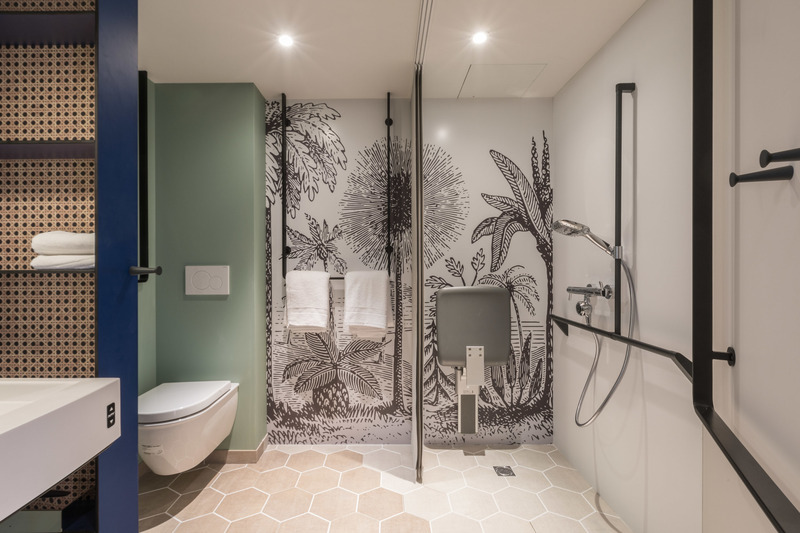 - a bathroom equipped with an easily adjustable showerhead, a folding and adjustable shower seat, a height-adjustable washbasin (70 to 90 cm), designer grab bars doubling as towel rails, etc. - customizable olfactory atmospheres with Sensorwake, for a gentle awakening to the aromas of either coffee, tea, sea breeze... as well as shower capsules perfumed with essential oils created by Skinjay. AccorHotels is a world-leading travel & lifestyle group and digital innovator offering unique experiences in more than 4,200 hotels, resorts and residences, as well as in over 10,000 of the finest private homes around the globe. Benefiting from dual expertise as an investor and operator, AccorHotels operates in 95 countries. Its portfolio comprises internationally acclaimed luxury brands including Raffles, Sofitel Legend, Fairmont, SO Sofitel, Sofitel, onefinestay, Rixos, MGallery by Sofitel, Pullman, Swissôtel and 25hours Hotels; the popular midscale and boutique brands Novotel, Mercure, Mama Shelter and Adagio; much-prized economy brands including JO&JOE, ibis, ibis Styles, ibis budget and the regional brands Grand Mercure, The Sebel and hotelF1. AccorHotels provides innovative end-to-end services across the entire traveler experience, notably through the acquisition of John Paul, the world leader in concierge services. 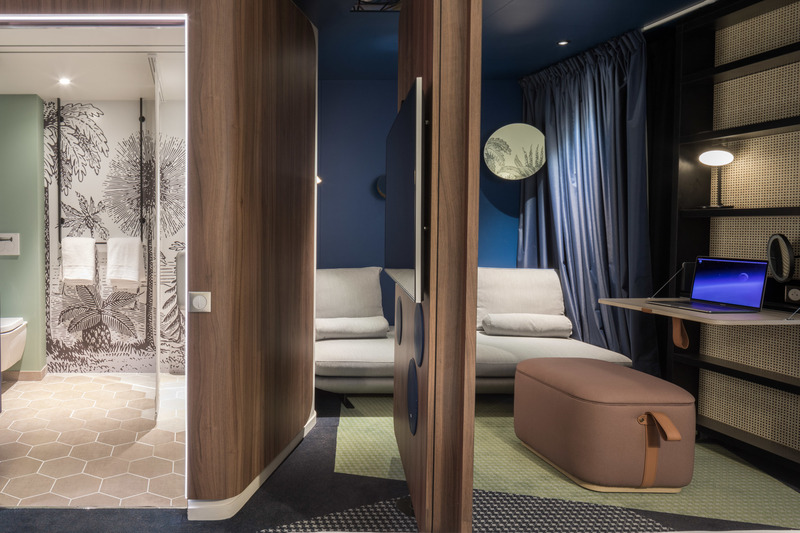 With an unmatched collection of brands and a rich history spanning close to five decades, AccorHotels, along with its global team of more than 250,000 dedicated women and men, has a purposeful and heartfelt mission: to make every guest Feel Welcome. Guests enjoy access to one of the world's most rewarding hotel loyalty programs – Le Club AccorHotels. Accor SA shares are listed on the Euronext Paris stock exchange (ISIN: FR0000120404) and traded in the United States on the OTC market (Ticker: ACRFY).